New & Modified Rules for Season 47 are in Pink. Any rules voted down or out at the End of the Season Meetings can NOT be voted on again for 1 year. You must read and agree with these rules to register for any RTR NR2003 events. This is only a GAME so have FUN. ***New Drivers are expected to READ and know our RULES, but we don't expect you to remember every rule. Every New Driver will be interviewed before being able to Race @ RTR. During your interview you will be asked if you know some of our main rules. You MUST have High Speed Internet & a Wheel to race @ RTR. You must be 21 years old or older to race @ RTR. All new drivers will be on a 90 day probation. We do allow some drivers under 21 to race @ RTR, but it is Mandatory that you speak to Terry Bauman, David Canon or Sean Prime in TS before your are permitted to race @ RTR. Drivers under 21 will be on probation until their 21st B-day. ALL DRIVERS MUST USE THE SAME NAME IN THE GAME AS THEY REGISTER WITH @ the SMS CFM. This must be your real name and we do NOT allow league or team tags on your name in the race Server. We do allow drivers to add their tag to the end of their name in Team Speak. If you do not wish to use your real name contact Terry Bauman or David Canon in TeamSpeak and we will work with you. Drivers will use their CFM name and place their full name in the last name field within the game. Leave the first name field blank. Your CFM login name must match your Player Info name or you will not be scored. Do NOT change your name mid season or you will be scored as 2 drivers. We do NOT fix points for name changes. All drivers are expected to Race with their correct Car # & Have there Car File uploaded to the CFM. Drivers will be given 2 weeks to correct either issue. After the 2 weeks expires you will NOT be scored until you comply. Exception: If a driver shows us they have made an Honest attempt to correct this issue we will work with them to get it corrected. If you need a car or truck painted post in the General Skin Request section of our forum and there are several very good painters that will gladly paint one for you. If you're NOT sure what to do to correct either issue ask a series director for help ASAP, DO NOT wait until your 2 weeks are up to ask for help. Click here to make a skin request. Drivers must use the same car # all season. You may request a different Car Number for the next season but you can NOT change your Car Numbers in mid season. If you switch car #'s in mid season you will NOT receive any points until you switch back to the car # you started the season with. Request your Car # Here ...You must be logged in to post. Do Not use another Drivers car #. Driver #'s are located in our forum here. If you are not in this list make a post to have your Car # added to the list. You are to use the same car # for all RTR Series. Drivers will only be allowed to upload 2 car files per series each season. This means if you have 2 car files in the CFM at the beginning of the season you are NOT allowed to upload another one. You are allowed to delete car files between seasons to upload new car files. If you have any issue deleting any car files see any RTG owner or Admin to help you. Penalty for uploading more than 2 car files in 1 season. Over 3 = Parked for 1 race for every car file over 3 in that series. If you have NO car file uploaded for a series and you win, you will NOT get a Winners pic on the RTG front page. Car files will be limited to NO more than 4mb. Any .car file in the CFM over 4mb will be deleted and we will assist the driver in reducing the .car file size. If your car file is over 4mb see Brian Schilling for help reducing the file size. Make sure all your instant messengers, anti-virus and windows updates are shut off before entering the server. We suggest you use End It All before you enter the server. We do NOT allow any substitute drivers in any series. Starting in S41 We have gone back to allowing Provisionals. Each driver will get 2 provisionals per series/per season. You MUST post in the forum or contact the series Director before the start of the next race to get a Provisional. Provisional Points = 2 pts less than last place. If there are multiple drivers asking for a provisional for the same race they will all receive the same points. Any drivers not able to race because of a natural disaster will receive last place points. To receive the points you must contact an Admin, post in the forum or Facebook or have a message relayed to us. BUT if a driver tries to take advantage of this rule and was not effected by a natural disaster they will get ZERO points for that race and lose both of there provisionals for that season. If you show up to race but are unable to get in the server because of a technical problem you will get last place points. You will not be charged a provisional. If a driver loses connection during a race we do NOT give laps back. This is considered a mechanical failure on your end. The only exception to this would be a server glitch which causes several cars to lose connection. The Top 5 finishers in every RTR race will be required to save their replay and keep it until the next race in that series. If you are asked for your replay and didn't save it you will receive the following penalty. 1st offence = DQ from that race and a possible suspension from all RTR Series. 2nd offence = To Be Determined by the RTR Officers. At any race the series director may request 3 random drivers to save there replays. This can be announced anytime during the drivers meeting or race. It is mandatory that all drivers be in team speak and have a working microphone. We allow limited Team Speak during the Race. If a director says to be Quiet or No more Team Speak you will be black flagged and/or parked if you continue to talk. Absolutely NO use of Team Speak or Text chat during qualifying. You may receive a black Flag at the start of the race for this offence. There is NO non race related chat on TS the 1st and last Yellow flag laps. If drivers are getting too carried away on TS directors may go to Race Chat only on TS for all Yellow flag laps. If you continuously break this rule you will receive a suspension. Whispering to directors or Admins during drivers meeting must stop. If you have a question for them wait until they ask if anyone has any questions. Will not be tolerated in any RTR event whether it is over Team Speak or through text chat. 1st offence: Probation, -1 lap penalty and/or Parked for a week. Using any profanity, especially the "F" bomb while flaming is an automatic kick from the server. Continue to Flame or make Outbursts after being parked: To be determined by the RTR Admins. 2nd offence: To be determined by the RTR Admins. This also includes IM's, emails and posts in the forum. Absolutely NO profanity, raciest remarks, flaming or making fun of other drivers in your binds/macro's. If you are a lapped car and you feel you need to race the cars that are racing for the lead and you take one or more of them out you will receive your 1 and only warning. 2nd Offence: Parked for the night. 3rd Offence: Parked for 1 full season from all RTR events. Use of NR2003 game glitches will NOT be tolerated @ RTR. If you are caught you will be Warned, Penalized, DQ'ed or maybe Banned from RTR depending on the severity of the offence. Passing pace car to extend the caution. Speeding on pit road with 1 to go to advance your position. Stopping at end of pit road to clear a green flag speeding in pits penalty. There are many more we are aware of so DON'T try them here. If you fall out of the server and reconnect during a caution you must hold your position and NOT pass the pace car. NO Racing Under the Yellow line or on the Apron!!!!!!!!!!!!!!!!! There is absolutely NO racing/passing under the yellow/inside line @ any track. The only exception to this is to avoid an accident ahead of you. Passing under inside line - Give position back ASAP or get a black flag or -1 lap penalty in replay review. Having 2 or more tires under the yellow line will be in violation of this rule!!!!!!!!!!!!! You will not be penalized if you accidentally go under the yellow line, only if you show intent to make a pass or improve your lap times. As blocking and protecting your position is part of racing there is no longer a lap rule on blocking. BUT if you excessively block or cause a wreck while blocking you will be penalized. If someone has a run on you let them go and then follow them to see why they are faster than you are. Penalties will become more severe after your 2nd offence. If you are found guilty of constantly blocking you may receive a suspension. Your Blocking causes a crash = -50% of your points plus penalties listed above. Blocking Definition: To make abrupt lane changes in an attempt to stop another competitor from passing you. If you are a lapped car and found guilty of blocking a car on the lead lap in an attempt to stop them from racing a car ahead of you. You will receive the penalty's posted below. 1st Offence: Parked for 1 week from all RTR Nascar Events. 2nd Offence: Suspended for 1 full season from all RTR Nascar Events. 3rd Offence: All done racing here at RTR. You may NOT call for a tow truck on the last lap of any race. You must retire!!! Cars being lapped on Super Speedways must stay HIGH or LOW and not in the middle of the track. Penalty for not doing this will be a black flag. If you are in the middle of the track when you are being lapped and cause a wreck you will be parked and scoring will be stopped there. There is NO stopping on the track under caution to go get a drink, use restroom etc. If you need to do any of these please pit and stay in your pit stall while doing so. You will receive a black flag if you stop on the track under caution just to keep your position. If you stop on the track to retire under green flag or during a wreck under caution you will be charged an Incident. Under Green: There is NO stopping on the track to retire. If you do so and the caution comes out you will be charged with intentionally bringing out the caution. If the caution does NOT come out you will still be charged an incident. Under Caution or during a wreck: You must make an honest effort to get back to your pit stall or at least safely get to the apron or infield. This will be looked on an Individual basis to see if you could safely get off the track. Intentionally bringing out the caution. Any driver who intentionally brings out the caution will be parked for 2 weeks from all RTR events. If a driver is found guilty of this in MSR or TNT you will be parked for 2 weeks in all RTR events. Examples: Stopping on the track to retire...Intentionally blowing your motor...Intentionally spinning someone out. There is No weaving back and forth under caution. You will be warned the 1st time and black flagged there after. If an admin feels a damaged car is a hazard to the other drivers the Admin may ask them to park. Here at RTR we race as individuals. We know drivers are more apt to help their friends or league mates and that is completely acceptable. But we will not tolerate unethical Team Tactics to boost your team stats. So if you use team tactics to show a lack of respect to any other driver in any RTR race on the track OR off, you and your teammates will be asked to leave. This includes using social media and streams to put down any driver from any RTR race that was not part of your team. Here @ RTR we Race Hard, Race Clean, Race with respect and treat our fellow drivers/members with RESPECT. If you can't do these simple things on the track and in this community your team will be asked to leave. We have always been an open server that welcomes most drivers. We also have a long history of visiting other servers. We never have and never will turn around and trumpet ourselves here or other places and say things like "our drivers beat your drivers", etc. We consider EVERYONE as simply "drivers" and "friends". We don't judge or discourage anyone who wants to be part of any team anywhere, and welcome any team driver members. We simply ask that you follow our rule and treat all other drivers with equal respect when racing at RTR. First off, this is racing, not demolition derby, not bumper cars. This does not mean you can wreck out someone because they are passing you or are faster than you. If you can't handle losing a race now and then DON'T RACE. If you "screw up" on the track or in TS an apology to the effected driver(s) or Admin(s) goes a long way toward resolving conflicts before they escalade into severe penalties. Careless, Reckless and Unsportsmanlike Driving will NOT be tolerated here at RTR. If you are found guilty of any of these during the season you will receive the following penalties. This is NOT the order the penalties will be handed out. If the offence is serious enough you can be charged with "Reckless Driving" even though you have never received a "Careless Driving" Penalty. Definition: This is the 1st tier of penalties for minor infractions such as outbursts in TS, ignoring Admins and on track infractions. This is basically a warning to drivers to calm down or you will be advanced to the next tier of penalties. Refer to the TeamSpeak rules for the 2nd TeamSpeak offence. 1st Offence : Warning to a -1 lap down penalty depending on the severity of the offence. 2nd Offence : Will be a -1 lap down penalty and be scored behind all cars on that lap. 3rd Offence : Will be considered your 1st Reckless Driving Penalty and carry its penalty. Definition: This is the 2nd tier of penalties and they carry stiffer penalties. Reckless Driving Examples: Dive Bombing, Continuously Driving on the apron/under yellow line to try to pass, unnecessary door slamming and any other on track antics that Admins consider Reckless Driving. 1st Offence : Scored last in the race results. 2nd Offence : Suspended for 1 Week from all RTR Nascar events. 3rd Offence : Will be considered your 1st Unsportsmanlike Penalty and carry its penalty. Definition: This is the 3rd tier of penalties and the most severe penalties. Unsportsmanlike Driving/Conduct Examples: Intentionally wrecking a competitor, Blatant disrespect towards fellow drivers or Admins and any on track antics or conduct that the Admins consider Unsportsmanlike. Penalty to be determined by the RTR Officers & RTG Owners. Retaliation of any form on the track will not be tolerated here at RTR. 1st offence : Suspended from all RTR events for 1 week. 2nd offence : Suspended from all RTR events for 1 month. 3rd Offence : Look for another league to race in because you are all done racing here at RTR. 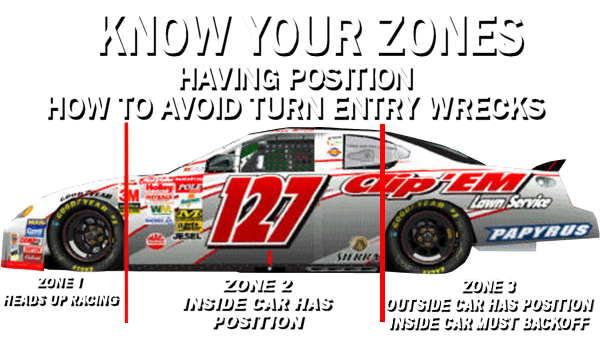 This is a general Idea of passing zones for short tracks and speedways. These zones are for when the cars starts to turn into the corner, not when the contact is made. This is only a guide line, this may not be used for all incidents. SuperSpeedways have distinct racing lanes. When changing lanes you must be completely clear of the car in that lane you move to. This is considered the bumper rule. If you're not clear of their bumper it's your incident. We have a 2 Incident and park it Rules. As we are all adults here you are expected to do this on your own. Penalty's if you do NOT park yourself. #1. 1st offence will result in you being parked the next week or DQ'ed if it's the last race of the season. You will also be on a 1 and park-it when you return. #2. 2nd offence in a season will result in you being parked the next week and having to run the rest of the season in that series with a 1 Incident and park it penalty. If there is less than 3 races left in the season this penalty will continue the 1st 3 races in the next season. #3. 3rd offence in a season and you will be suspended from all RTR events the rest of the season. If there is less than 3 weeks left in the season you will be suspended for the 1st 3 weeks of the following season. Incident definition: Any action by you or your internet connection that results in the Yellow flag coming out whether it be a self spin, mechanical failure or contact with another car. An incident caused by your warp or your connection issues will count toward your 2 and park-it. An incident which is a result of a mechanical failure such as a blown gear or blown motor, will NOT count toward your 2 incidents and park-it but you must do a 4 tire pit stop if you are still in the race. A caution caused by a blown tire will count as an Incident toward your 2 and park-it. If you are the cause of an Incident or think you are the cause you must do a 4 tire pit stop on the 2nd caution lap or later. If you fail to serve your penalty you will get a -1 lap penalty and be scored behind all drivers on that lap. If the incident occurs in a series that has limited tire stops or a Dirt Series you may do the 4 tire stop on the 2nd caution lap or later or, Speed on pit road to get an EOLL penalty on the 2nd caution lap or later. Failure to serve your Incident Penalty 3 times in a series in a season will result in being put on a 1 and park for the rest of the season in that series. Year long series will be by segments. The 1st solo self spin on dirt will NOT count toward your 2 and park. BUT if this effects any driver other than yourself it will count as an incident. Examples: Driver hits you or you hit another driver. A driver gets damage trying to avoid you. The 1st solo self spin still counts as a -1 penalty point. You must park it for the night and will be on a 1 Incident and park until you complete an incident free race in that series. If you fail to park after your 2nd incident your scoring will stop on that lap and you will be parked the next week. You will also be on a 1 Incident and park until you complete an incident free race in that series. If it is found in the replay review that you have 3 or more incidents in 1 race you will be parked for 2 weeks in that series for the 3rd incident and 1 additional week for every incident after that in that race. You must complete a clean race to get back on 2 and park-it. Retiring from a race early for any reason will NOT get you off the 1 and park-it. The ONLY exception would be if you're crashed out of a race and it's NOT your fault or a mechanical failure. If you are on a 1 and park for the remainder of a season because of having 5 incidents or did not serve 3 incident penalties you can not get off a 1 and park until the next season. You will be permitted to Qualify while on a 1 and Park. We realize that occasionally in the post race review an incident needs to be called a racing deal. But this is only after multiple Admins have reviewed the incident. If an incident is called a racing deal there is NO post race penalty for any driver involved. But remember just because a driver('s) call an incident a racing deal during the race, it doesn't mean it will be called a racing deal in the post race review. Incidents caused from side drafting, pinching down or up. We are not saying no one can side draft or pinch someone down or up BUT, if an incident happens while doing so YOU will be charged with the incident. This will be called the 1/2 a car width rule...If you can't give someone at least a 1/2 a car width of room to move and an incident happens between you two then you will be charged with the incident. The Driver who was spun must make a complaint/protest post race to the race director. If you spinout a driver and the caution does NOT come out you will be required to do a drive thru or get a -1 lap post race penalty. This will also count as an Incident toward your 2 and park-it. If this happens on the last lap of a race the guilty driver will be moved to the EOLL of the lap they finish on. If you spinout a driver and the caution does NOT come out you will be required to do a drive thru on the next lap or get a -1 lap post race penalty. If you cause an incident and lead a lap by staying out the 1st lap of Caution, You will have this lap removed from the scoring by the Race Director. Any driver who causes an incident in the 1st or 2nd corner on a restart from over aggressive driving will get a Careless Driving Penalty. If the Director or a driver feels an Incident might be controversial they may request the Incident be reviewed directly after the race conclusion. There must be a minimum of 5 drivers reviewing the Incident and be done in a private room in TS. The results of this review will be Official and can NOT be protested. The Director will post "reviewed by drivers" for this incident in their incident report. All Incidents will NOT be reviewed like this, Only possible Controversial Incidents. Drivers involved in the incident are NOT allowed to be in the review room. If you're protesting an incident that has been charged to you, you must protest within 48 hrs of the incident report being posted in the forum. Protests must be made by the driver charged with the incident, 3rd party protests will NOT be reviewed. Incident reports will be posted within 72 hrs of the conclusion of all races. All protests must be directed to that nights race director. See who the race director's are here. If you lose 3 protests @ RTR in 1 season, you will lose your right to file any more protests for the remainder of the season @ RTR. You must provide a replay clip from YOUR replay with any protest. Replay clips must be a minimum of 30 seconds before and after the incident being protested. There will be NO goofing off during practice...any driver caught goofing off during practice will be parked until Qualifying. Once the server is reset for the drivers meeting Do NOT Manually Disconnect from the server without a server Admins permission or you will start the race with a black flag and/or not be allowed back in the server. If this becomes a habit don't expect to be allowed back into the server. The Race director will hold the drivers meeting at the scheduled time. Then announce to all drivers there will be a 10 minute happy hour after the drivers meeting. When the 10 minutes are up we will go to Qualifying. There will be NO TEXT chat during drivers meeting unless it is a race related question. Text chat of the drivers meeting for the hearing impaired will be allowed. 1. We will go to the Qualifying session NO Later than 8:45 est. but then we will only have a 1 minutes Happy Hour after Qualifying. 2. The Top 3 in points and the winner from the previous race may NOT qualify, everyone can Qualify the 1st race of the Season. The only exceptions to this will be Road Courses and Season Finales that are NOT Chase Races. Chase Drivers may NOT qualify at any race, this includes Road Courses and all Season Finales. If any do Qualify they will start the race with a black flag. This includes qualifying and then getting your times DQ'ed. 3. All other drivers are asked to post a qualifying time but no penalty will be accessed if they don't. 4. Any driver who shows up during the drivers meeting or too late to practice will NOT be permitted to Qualify. 5. Any driver who shows up after Qualifying has completed but before the race has started will NOT be permitted to race but will receive last place points for that event. The driver winning the pole position must start where the game puts them, they don't have a choice of high or low. On restarts the race leader still has the choice of high or low. If there are more than 42 drivers that show up for a race the top 25 in points are locked into the field. All other drivers must run a Qualifying session and the top 17 will make the field. Any driver not making the field will get a DNS and receive 1 point. If this is the 1st race of the season the top 25 in points from the previous season will be locked in. If this is a special event, special qualifying rules will be posted for it. Each RTR series has the option to use a 1st come 1st race format. This must announced at the beginning of each Season and be posted in the forum. The Top 25 drivers in points are locked into the race. Top 25 drivers must be in TeamSpeak by 8:20 pm est. or may be replaced with a waiting driver. All other race slots will be filled on a 1st come 1st race basis. Exemption: If a driver in the Top25 in points notifies an admin they will be late their slot will be saved until the end of the drivers meeting. After the drivers meeting their spot will be filled by the next driver in the waiting list. Start Requirements for Broadcast events. Unless posted otherwise you must have raced 33.3% of the races already ran in that season. Year long points paying series such as Cup or Nationwide. Unless posted otherwise you must have raced 33.3% of the races already ran that year. If at any time a driver Qualifies substantially faster than the rest of the field we may ask for a replay clip of your qualifying run to verify you did NOT cut the track or exploit any game glitches. The replay clip must be sent to the RTG contact us link within 15 minute of the conclusion of the race. If you fail to produce a replay clip within 15 minutes you will be DQ'ed from that race. If you fail to produce a replay clip a 2nd time the penalty will be decided by the RTR Officers. Absolutely NO use of Team Speak or Text chat is allowed during qualifying. Normal Happy Hour is a 5 minute duration, after Qualifying. Goofing off during Happy Hour will be up to the individual Race Directors. The Race Director will announce in their drivers meeting if it is ok to goof off or NOT. There will be NO Goofing off in Happy Hour of any Broadcast Event. Doing so will result in getting a Black Flag at the start of the race. The Green flag starts the Race. There is NO jumping the start/restart, you must wait for the green flag. There is NO attempting to pass high or low on the start of the race or any restart until after you cross the start/finish line. There is NO moving high or low before the start/finish line to set someone up for the pass after the start/finish line. This includes changing lanes also. Stay in your lane until you reach the start/finish line. Penalty for all above = Black Flag or -1 lap post race penalty. We will allow 1 race restart if there is an Incident or a driver has an issue before all cars complete lap #2. Any driver causing a race restart from an incident will be charged an incident and will count toward their 2 and park-it. All restart incidents will be reviewed post race with the race incidents. If someone has a mechanical failure or falls through on the pace lap it will NOT be considered a restart. Only 1 mechanical restart per driver/per race. On restarts the race leader must stay +/- 5 mph of pace speed and will go on GREEN. If you are more than +/- 5 mph of pace speed or drastically varying your speed before you start the restart you may receive a black flag or a -1 lap post race penalty. The leader must stay within 1.0 seconds of the pace car until it leaves the track on the start or any restart of the race. Playing games on restarts will get you black flagged. Lagging back, break checking the field or anything we feel is not within race ethics. Penalty = Black Flag or a -1 lap post race penalty. All drivers must maintain a 0.1 - 0.3 second gap from the car ahead of you. If you are damaged we ask that you pit with 1 to go and start at the back of the lead lap cars or lapped down cars, which ever pertains to you. This is NOT mandatory but just being respectful. When the caution comes out, HOLD YOUR LINE and RACE AT A STEADY SPEED back to the line. What this means is, don't let off the throttle all the way and don't try to pass the person in front of you. Hold your position and wait to slow in turns 1 and 2, not the START/FINISH LINE. Anyone caught intentionally passing for position under yellow may receive a black flag or a -1 lap penalty. It was voted that if the game does NOT throw a caution the Admins will NOT do so either. This will start in Season 39. If you are involved in a wreck and are sitting backwards on the track DO NOT turn around in front of the field. Wait for the field to pass you and then safely turn around. If you try to turn around in front of the field and someone hits you, hits another car or hits the wall to avoid you, you WILL be charged an incident for this. Causing a wreck under caution will result in you getting charged with an Incident. If you are found guilty of racing into a wreck and hitting or causing damage to another car you will receive the following penalty. 2nd offence = Parked the next week. This is NOT to be confused with plowing through a wreck or failure to slow enough for a wreck as these are Careless Driving offences. And should never be confused with being part of the wreck, a continuation of a wreck or just not enough time to slow for the wreck. Restarts, Lucky Dogs & Wave Arounds. 1. When the Caution comes out reduce your speed and hold your position to the Yellow flag. 2. Lap down cars must drive down pit road on the 2nd caution lap or later. Pitting is the drivers option, But they must at least drive through the pits. If any lap down cars do NOT pit they will be asked to drop to the rear of the field on the 1 to go lap and NOT be eligible for the next Lucky Dog. Any lead lap cars that pit after the 1st yellow flag lap will line up where they come out of the pits. If they are behind lap down cars they restart behind them. Wave arounds MAY NOT pit. 3. Lucky Dogs will pit on the 2nd caution lap with the lap down cars (DO NOT PIT @ 1 TO GO). Lucky Dogs must wait to go around the track until we get the 1 to go, Wave arounds will follow the lucky dog. These cars will line up single file behind the longest line. 4. The field will form double file when we get the 1 to go. The race leader has their choice of the high or low line, 3rd on back will line up evens high and odds low. 5. The Leader will go on GREEN. The leader is NOT permitted to start before the GREEN Flag. There is NO attempting to pass high or low on any restart until after you cross the start/finish line. This includes changing lanes also, stay in your lane until you reach the start/finish line. Any car may beat the leader to the start/finish line as long as they did NOT take off before the GREEN Flag. At any time the race directors may go to single file restarts for the rest of the race. We will use the in game single file restart. All lap down cars will be required to do a drive through on the 2nd Yellow Flag lap or later. Unless a lapped car pits Do NOT pass any cars while doing your drive through, Pitting is optional. The race will restart on the GREEN FLAG. There will be NO attempting to pass on the high or low side before the start/finish line. "This includes pulling out of line early to set them up after you cross the start/finish line"
If a driver is found to have ran the stop sign at the end of pit road to avoid going down a lap they will receive a -1 lap post race penalty. Lucky Dog is given to the 2 drivers 1 lap down closest behind the race leader when the field catches the pace car, if no cars are 1 lap down it will be given by running order. If you receive the lucky dog pit on the 2nd yellow flag lap (DO NOT PIT @ 1 TO GO), after you leave the pits pass the field on the HIGH side of the track and line up ahead of the race leader and the wave around cars. DIRT: Lucky Dogs on Dirt will line-up EOLL and get a LAP + when it goes green. Ignore your spotter when he tells you to let them by. When you get the 1 to go, go all the way around the track and line up at the end of the longest line. The race director will clear your black flag after the green re-start. If you do NOT go around the track to take your lucky dog you will NOT be eligible for the next lucky dog! Lucky Dog has been extended to all race long. To be eligible for a wave around you must be ahead of the race leader when we get the 1 to go. Wave around drivers are NOT allowed to pit during that caution. When we get the 1 to go the Lucky dog plus all wave around cars will be waved around and line up single file at the end of the longest line. All black flags will be cleared when we go green, be patient and repost your car # if your bf hasn't been cleared in 1 lap. Until 15 laps to go a Series Directors may extend the caution by 1 lap while the green flag is out to allow UNLIMITED Wave Arounds. Once the caution lights go out the pits will be CLOSED to all cars, pitting after this time will be a black flag or -1 lap post race penalty. Once the green flag is waved all Lucky Dogs and Wave Arounds will go and line up single file at the EOLL. Race Admins will clear the Lucky Dogs black flags during this lap. If the caution is extended the restart point for the race leader will be the start/finish line. If the caution comes out with 15 or less laps to go there is a maximum of 4 wave arounds and NO extended caution lap. We DO NOT clear self inflicted Black Flags. If you get a Black flag as a result of another driver we may clear it. Examples: A driver couldn't or wouldn't pass you while coming to the GREEN FLAG. If we clear a black flag and it was legitimately yours, you will be penalized -2 laps in the final race results. Unless stated otherwise in the drivers meeting you may enter and exit pit road per game rules. When driving down pit road please stay as far to the outside as possible. If you cause an incident from driving thru pit stalls (we will give you a 2 pit stall grace), driving in the inside lane or just being stupid you will receive an incident. If while on pit road or exiting pit road you are spun out, knocked into the grass or the track you may make a post race complaint/protest with the race director. If a driver is found guilty of any of these infractions it will be considered an incident on that driver. The Guilty driver will be required to do 4 tire pit stop under caution or do a green flag drive thru if it happened under green. If not the guilty driver will get a -1 lap post race penalty. Causing a wreck while fake pitting or late pitting under caution will result in you getting an Incident. This will count toward your 2 and park-it. Drivers will NOT be allowed to pass between a car and pit road wall. Penalty will be a Black flag or a -1 lap post race penalty. Incidents Entering Pit Road not bringing out the Caution under green flag pit stops. If you cause a wreck while pitting under green and the yellow doesn't come out you will be charged an incident and must do a green flag drive thru on the next lap. If the Yellow comes out before you can do your green flag drive threw you must be at the end of the longest line on the restart. If the yellow comes out because of your crash it will be considered a normal incident. There is NO speeding down pit road to lead a lap. If caught during the race you will receive a black flag and your lap led will be taken away from you. If caught during replay review you will be moved to the last car scored a lap down to the lap you finish on and your lap led will be taken away from you. If a caution comes out in the last 5 laps you must maintain pace speed under your own power. If you are assisted by another driver (Pushed) because of damage or running out of fuel your scoring will end there. If an accident happens at the start/finish line with 4 or less laps to go the field will be froze on how all drivers merge back into the field, NOT your F2 position. The final results will not be Official until a mandatory replay review is completed. We will also be looking for anyone intentionally passing under caution and racing into the wreck. Anyone receiving a black flag because of this will have it cleared. This rule is mostly for super speedways but will go for any race. Any race that is concluded no matter what problems occurred during the race will be scored. If you intentionally cause a wreck between the checkered flag and the back straight you will charged an incident and moved the EOLL of the lap you're on in scoring. If the race is more than 50% completed and the server crash's the race will be official if someone is able to save the export or replay. But if NO export or replay can be saved the race will be considered a rain out and may be rescheduled. If there is time the admin may take a driver vote on whether to restart a shortened race. Road Course Races will be as below. 40% race with yellows flags off with 1 competition caution. 40% race with Caution only when 3 or more cars are involved in a wreck. 35% race with yellows flags on. The race may be restarted if 2 or more cars are involved in a wreck on the 1st lap. Solo self spin will NOT be a restart unless this car gets damaged. It is the drivers involved responsibility to let the Admins know they need a restart. Any driver being lapped by a car on the lead lap is to yield the position to that car ASAP. If a lapped down car or car being lapped is found guilty of blocking a lead lap car that driver will be parked the next week. This rules goes for the whole race, the last 10 lap blocking rule does NOT apply here. 2nd offense penalty will be determined by the RTR Admins. Road races with yellow flags turned off will have 1 competition caution some time in the 1st 1/2 of the race. This will be done with a bind saying "Yellow Yellow Yellow" and be announced on Team Speak. All cars will reduce their speed and maintain a safe distance from the car ahead of them. 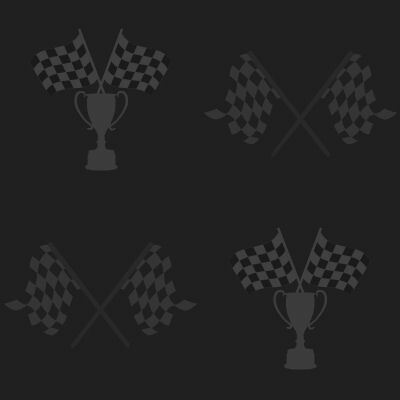 Any driver caught intentionally passing will receive a black flag or -1 lap post race penalty. We will announce who the Lucky Dogs are. The Race director will set the pace speed during the competition cautions. All lead lap, lap down cars & Lucky Dog may pit when they get back to pit road. If after the lead lap cars go into the pits and there are any wave arounds they will slow down and wait for the field to catch them after pitting. Once the field is bunched up the Lucky dogs and wave arounds will drop to the rear of the field and they will get a lap back (Lap+). Anyone who receives a black flag during the pit stop will get it cleared but they must go EOLL. They will line-up behind any lucky dogs but ahead of any wave arounds. All restarts will be Single file and the race leader will control the restart at or just before the start/finish line. There is NO attempting to pass high or low before the start/finish line. Cautions will be turned off. The Race Admin will throw a caution if there is a wreck involving 3 or more drivers. All cars will keep a safe race pace and maintain a safe distance from the car ahead of them to pit road or start/finish line. Any driver caught intentionally passing may receive a black flag or -1 lap post race penalty. Pitting during this caution will be optional. Anyone NOT pitting must slow to a very slow pace to wait for the field to leave pit road. Wave arounds are NOT permitted to pit and after they pass the start/finish line they must slow down to a very slow speed to wait for the field. The Race director will set the pace speed for after all cars leave/pass pit road. The field will line-up as below. Cars that had black flags cleared. We will give all Lucky Dogs and Wave Arounds a Lap+ before we go green. Penalty for jumping out of line or attempting to pass or trying to set-up a pass before the start/finish line will be a black flag or a -1 lap post race penalty. You must have at least 2 tires on the racing surface at all times. Curbs are NOT considered the racing surface. If you lose control and/or spinout or go off the track this will NOT be considered as cutting the track, but if this results in you going straight through a chicane or corner, we ask you do the 20 mph penalty or you may be penalized. Cutting Track on Road Course Penalties. 1st 2x's = Safely slow down to 20 mph and then go again. Please do this off the racing groove and not in a corner. If you fail to do your 20 mph penalty you receive a -1 lap post race penalty. I do not agree with these rules. I have read these rules and am ready to register.